Marta DELLA SETA is Researcher of Geomorphology at the Department of Earth Sciences of the Sapienza University of Rome (Italy). She got the M.Sc. degree in Geological Sciences at the Roma TRE University (1999) and the Ph.D. degree at the Sapienza University of Rome (2003). She has been member of the Executive Committee and Chair of the Commission on Website and External Relations of the Department of Earth Sciences. 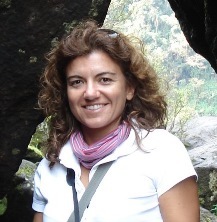 She is Chair of the Structural, Tectonic and Volcanic Geomorphology Working Group of the Italian Association of Physical Geography and Geomorphology (AIGeo). She teaches courses of Geography, Thematic Cartography and GIS, Geomorphological Survey and Mapping, Applied Geomorphology. iv) volcanic geomorphology, through the morphological and morphometric analysis of some Italian volcanic complexes. She focused her research, also in cooperation with other scientific groups, on the Mediterranean region (Italy, Southeastern Spain) and the Central Iran. In particular, in Italy she studied the Marche-Abruzzo peri-Adriatic region, the Tuscany-Latium peri-Tyrrhenian region, the Adamello-Presanella Massif, the western Calabria and the Ischia island. She is co-author of more than 40 papers published on national and international journals. She is reviewer for several national and international journals and she is in the Editorial Board of Catena (Elsevier) and of the Italian Journal of Engineering Geology and Environment (Sapienza University Press). Her research has been funded by the Italian Ministry of Instruction, University and Research, Italian Civil Defense, EU-FP7, Spanish Ministry of Science and Innovation.